... I'm going to take a little break to update you on the latest thoughtless ... inane ... oddly conceived plan drummed up by George Steel to cut costs at New York City Opera. Yes, I'm back on my soap box regarding New York City Opera. Daniel Wakin of The New York Times reported today that George Steel has a plan to save on warehouse costs. He has decided to sell off - or, in some cases *trash* - the majority of productions that City Opera owns. That's right: sets, costumes and all. The company will then completely vacate their warehouse and Steel's idea is to store the few productions they'd like to keep ... in trucks. Therein lies the core issue with what is wrong happening at City Opera ... “an extremely expensive way to store things.” Things? THINGS? These aren't just "things". These are the bones of entire productions ... many of which have significant value in American operatic history. And, just for the record, the company’s website lists more than 90 productions available for rent- including Renata Scotto’s 1995 La Traviata; a 1982 Candide directed by Harold Prince; and several productions with sets designed by Maurice Sendak, who is best known for his book Where the Wild Things Are. 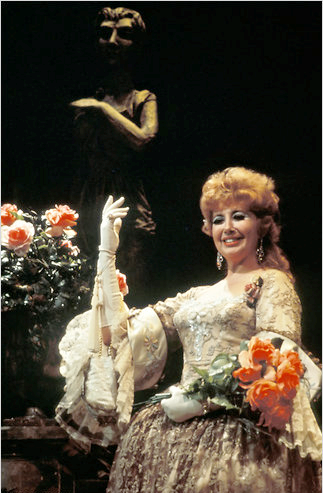 Also, included are the works created for City Opera's longtime queen, Beverly Sills ... productions such as Donizetti’s trilogy — Anna Bolena, Maria Stuarda and Roberto Devereux — not to mention the 1968 Manon. Of the 90 productions in the warehouse, Mr. Steel said that only “a very, very small number” would ever be revived and that other productions have been eliminated — like the 2009 Don Giovanni which has been rented by Portland Opera. The poor folks at Portland Opera have been directed to dispose of the production as soon as their run is complete. After all, as per George Steel, if they want to revive the production, the sets and costumes could be reconstructed at a lower cost. Evidently, the age of disposable opera productions is upon us. And, what about all of those co-productions that City Opera undertook as a sort of "feeder" into Glimmerglass? Well, the president of the board of Glimmerglass and a former City Opera executive producer, Sherwin M. Goldman, told The New York Times that they have been informed that if they should want any of the co-productions, they should come get them or they will be thrown out. One of the productions that Goldman is looking to save from the chainsaws and furnaces is his own production of Porgy and Bess. I might suggest - at least where costumes are concerned - that Mr. Steel has them donated ... perhaps to universities with Opera Programs. Although, it seems that a good percentage of this Chuck It All Initiative is about making money ... which donating does not accomplish. Why hasn't anyone erected a wing at a museum dedicated to the History of American Opera? Certainly, if there was such a thing - or perhaps a Museum of American Opera History - many of City Opera's most historic pieces could be housed there instead of going by way of the shredder. After all, City Opera has always championed the work of American composers. Fun fact: approximately one-third of City Opera's repertoire has traditionally been American opera. Listen, I understand that many companies do away with old productions - or they often will recycle productions and re-purpose them into new ones. It happens. My issue is not ultimately with that. I take issue with the fact that George Steel seems so very flippant about the whole thing. He clearly believes that where New York City Opera has come from - it's rich history - has absolutely no bearing on where it is going. I get the sense that he is of the opinion that the company is merely throwing away some unwanted, unused, squeaky old office chairs. Some out-of-date desk phones, perhaps? "Meh ... just chuck them out." Daniel Wakin points out rather nicely that the idea of trashing the old productions will further pain those who lament New York City Opera’s demise as a major repertory company. These are the same people that respect its past — the days of Beverly Sills, Plácido Domingo and Julius Rudel — and also respect that in 1943 Mayor Fiorello La Guardia founded the company as the "people’s opera." These are the same people that understand that opera is just as much about moving forward with new productions as it is maintaining opera's rich history. Maestro Rudel, who has been an outspoken critic of Mr. Steel’s, told The New York Times that the loss of old productions is "horrendous," adding: "It puts the final nail in the coffin. It means there is no more company." In George Steele's eyes, these steps being taken to put many of its productions on the curb for trash day have absolutely nothing to do with the future of the company (except to make it some money, of course). After all, the company's new focus is as a forward-looking presenter of disposable new productions. Yes, Mr. Steel has been "trying to sort it out" for almost 4 years now. Perhaps George Steel is taking the "cooking pasta" approach to running New York City Opera ... while the pasta is cooking, he keeps pulling pieces out of the boiling water and throwing them against the wall in hopes that, at some point, something will stick. For extra credit, Chickpeas - I suggest that you take a look at NY City Opera: An Op/Ed from it's former Maestro - Julius Rudel, as well as NY City Opera: An open letter to Mayor Michael Bloomberg from MusicalAmerica.